Mac Audiobook Converter to convert any audio books which could be played on iTunes to MP3, AAC, WAV formats with 5X speed and CD output Quality. 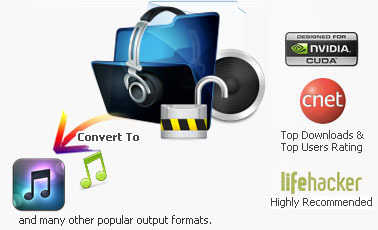 Convert purchased audiobooks to unprotected MP3 or AAC file! If you have just bought some audio books from Audible and wanted to be able to play them on various players, but they were as AA file types and will not play on your mp3 player! No problem! 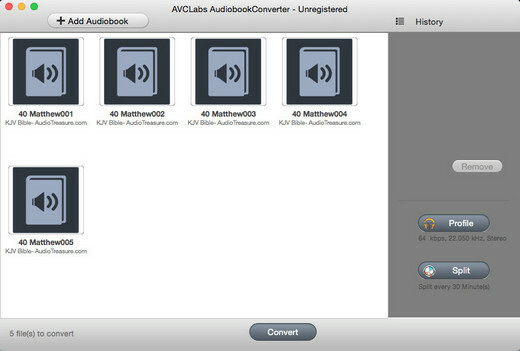 With AVCLabs Audio Book Converter for Mac, you can easily select AA files from iTunes audiobook library. Then convert them into MP3 or AAC in 5X speed to play anywhere and transfer to your iPod, iPhone or other portable MP3 players, such as Creative zen, iRiver. Audio Books from companies like Audible are great for anyone who travels or commutes. Unfortunately, these audio files are not allowed to be transfered to devices like basic MP3 player, Sony PSP, cell phone, laptop, portable PC or standalone DVD player with MP3 support. You may use AVCLabs Audio Book Converter for Mac to free your Audio Books out from protection that can be played with Windows Media Player and iTunes. You can convert any audio book into MP3 or AAC format. So, it's also an .aa converter, purchased audio book converter. In AVCLabs Audio Converter, if you choose M4A as output format, you can select to keep chapters of your source audiobook. Easy to batch convert Audiobook with fast speed! The AudioBook converter makes Audio Book to mp3 batch conversion simple and easy. You may select several audio book files to convert. Then click "Convert" button to start converting. What you need to do is just wait for the result of conversion. The ID Tags will be preserved in output MP3 or AAC files while converting. When you split a big audio book file to several small files, the ID Tags will be preserved, too. Audio book you purchased can only burn to Disc once on each authorized Mac, but no limitation of play it on your iTunes. 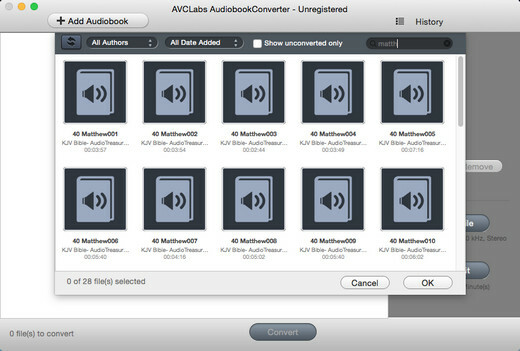 So, if you want, you could convert them as many times as you want with AVCLabs Audio Book Converter. Audio Book Converter won't install any virtual drive, and needn't any extra hardware. You just install it on your Mac, then start your conversion. All video supported Nokia Smartphones including Nokia N97, Nokia N96, Nokia N95, Nokia 8800 Gold, Nokia 2323, Nokia 5800 and so on. Audiobook Converter for Mac can convert any audio book files on iTunes to MP3, WMA and AAC format on Mac OS X.
Audiobook Converter for Mac works with iTunes and sound recording technology to convert audio books, so it keeps the users on the legal side. If you want to add audio files from iTunes, please refer to the following tutorial. Step 1. Click Add button, you will see the files available in the popup dialog. Step 1. Click Add button, input the text in the search field, then you will see the matched files. Step 2. Press OK button. All files will show in the file list.